The Office of Terrorism and Financial Intelligence (TFI), formed in 2004, is an agency of the United States Department of the Treasury. TFI works to reduce the use of the financial system for illicit activities by terrorists (groups and state-sponsored), money launderers, drug cartels, and other national security threats. TFI oversees the Office of Terrorist Financing and Financial Crimes, the Office of Intelligence and Analysis, the Office of Foreign Assets Control, the Financial Crime Enforcement Network and the Treasury Executive Office for Asset Forfeiture. 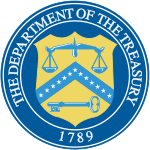 The U.S. Treasury Department is the only national finance ministry with its own in-house intelligence agency, with offices around the world, including Islamabad and Abu Dhabi. ^ "Testimony of Under Secretary Cohen before the Senate Subcommittee on Financial Services and General Government". the U.S. Department of the Treasury. 2 April 2014. Retrieved 10 January 2017. ^ Philip Weiss (17 July 2016). "Iran deal is still imperilled by deep state– hardliners". Mondoweiss. Retrieved 17 July 2016. ^ "Terrorism and Financial Intelligence". www.treasury.gov. Retrieved 8 July 2015. ^ Liberto, Jennifer (16 February 2010). "Treasury's quiet war". CNN. Retrieved 8 July 2015. This page was last edited on 30 December 2018, at 07:51 (UTC).